What an amazing journey! 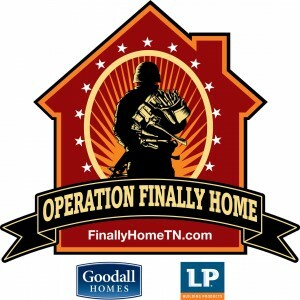 Today, May 24, 2012, Shaun and Nicole Meadows, along with their son Trevor, will receive the keys to their brand new BEAUTIFUL home, compliments of Operation Finally Home, LP Building Products, Goodall Homes, and many other subcontractors who have donated their time and resources to make this dream come true. Shaun is a veteran whose story inspired Operation Finally Home to want to show gratitude to him for serving our country in an amazing way! Over the past few months, Goodall Homes and many others have been building Shaun and his family their dream home in Lynnville, TN. It is truly amazing, and today the home will become their very own! Congratulations, Shaun and Nicole--it has been so great getting to know you all! Enjoy your new home!